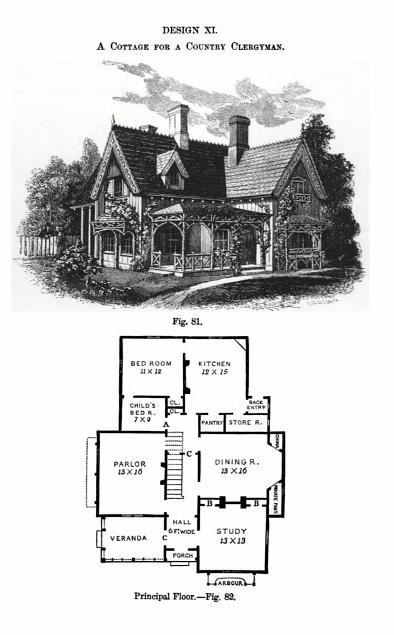 Using the designs and philosophy of Andrew Jackson Downing, Josiah Willard designed a nine-room Gothic Revival house, closely resembling a design for “A Cottage for a Country Clergyman” in Downing’s 1842 pattern book Cottage Residences and Cottage Grounds. On the first floor there were four rooms — a parlor on the southeast corner, a kitchen on the southwest corner, a study across the hall from the parlor in the northeast corner, and the dining room in the northwest corner. On the second floor there were four bedrooms, two across the front of the house in the southeast and northeast corners, and two on the west side of the house, including a very small one for the maid. Josiah Willard’s reasons for building this new house and modeling it after Downing are unknown. Frances Willard speculated that her father may have felt, in his grief over Mary’s death, “that he could strengthen himself by new environments.” Mary Hill Willard stated that her husband was “most appreciative of the writings of A.J. Downing,” and thus he may have believed, following Downing, that the house would lend its influence “to an increased refinement and moral elevation” of those who lived in and visited it. 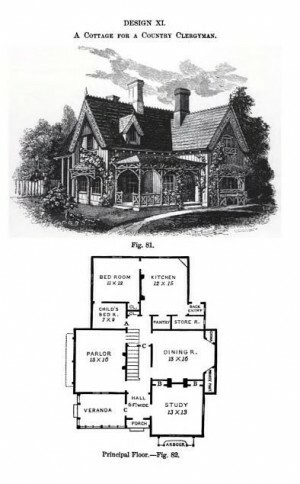 He may have also felt, in choosing the Gothic style (modeled by Downing after the verticality of Gothic cathedrals) that he was building a home where he and his family could connect once again with their spiritual lives. For whatever reason, Josiah Willard set about transforming the swampy plot he had leased from Northwestern University into a beautiful home and garden filled with the “choicest and best” plants.